The Delta Q IC650 48 volt battery charger has proven itself as a high-performance battery charger for electric pallet jacks, floor care machines, scissor lifts. With the touch of a button, users can switch between charge profiles for lead acid (wet/flooded, sealed AGM or gel) brands or battery chemistry. This Delta Q 48 volt Golf Cart Battery Charger is not only the perfect charger for your golf cart but because it is designed to be used in an onboard application and because it is so small yet so powerful it can also make for a great battery charger for your floor scrubber or buffer, walk behind fork lift or pallet jack, and even smaller scissor lifts. IC Series battery chargers provide superior reliability in difficult applications, charge quality for lead acid and lithium-ion batteries, and ease of integration for electric drive vehicles and industrial equipment. Key features include IP66-rated sealed enclosure, optional CAN bus communication and USB host port for charge cycle data download and software updates. The IC650 48 volt battery charger has proven itself as a high-performance battery charger for electric pallet jacks, floor care machines, scissor lifts and e-mobility scooters. With the touch of a button, users can switch between charge profiles for lead acid (wet/flooded, sealed AGM or gel) brands or battery chemistry. It ca even charge Lithium-ion batteries by connecting it to a battery management system or controller using CAN bus. The IC650’s overall design for reliability ensures that machines are ready to run every day. The All New Delta Q IC650 48 volt battery charger has a broad AC input range of 85-270V, allows for global use on any single-phase electrical grid. Wide regulatory approvals allow the IC650’s use in electric vehicles and industrial equipment sold internationally. All IC650 battery Chargers can be customized with specific AC and DC cables for your application no matter where you live in the world. Combined with the ability to add a specific charge profile for your lead acid (wet/flooded, AGM, gel) or lithium batteries make the all new Delta Q IC650 48 volt golf cart battery charger one incredibly versatile battery charger. It is designed for onboard or off-board use depending on your personal preference or needs. Here is a brief video to learn even more about Delta Q Battery Chargers and can help you determine if you need the IC650 48 volt golf cart battery charger or if the Delta Q QuiQ Battery charger line is best charger for your application. If durability is a concern for you when selecting your next battery charger you can watch this brief video. Get a laugh and decide for yourself if a Delta Q charger is right for you. 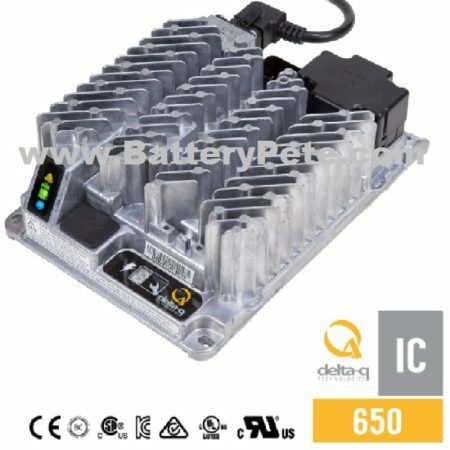 Be the first to review “Delta Q 48 volt Battery Charger IC650 – 48V 13A 650Watt 940-0003” Click here to cancel reply.